WASHINGTON (CNS) — More than 70,000 people attended the NCAA men’s basketball championship game at Houston’s NRG Stadium April 4, but no one had a seat quite like Augustinian Father Rob Hagan. Father Hagan, associate athletics director at Villanova University, had a front-row seat to the historic game on the Villanova Wildcats’ bench. The priest, chaplain of the university’s football and basketball teams and known by players as Father Rob, also spoke with the team hours before the championship game during their traditional prayer service. 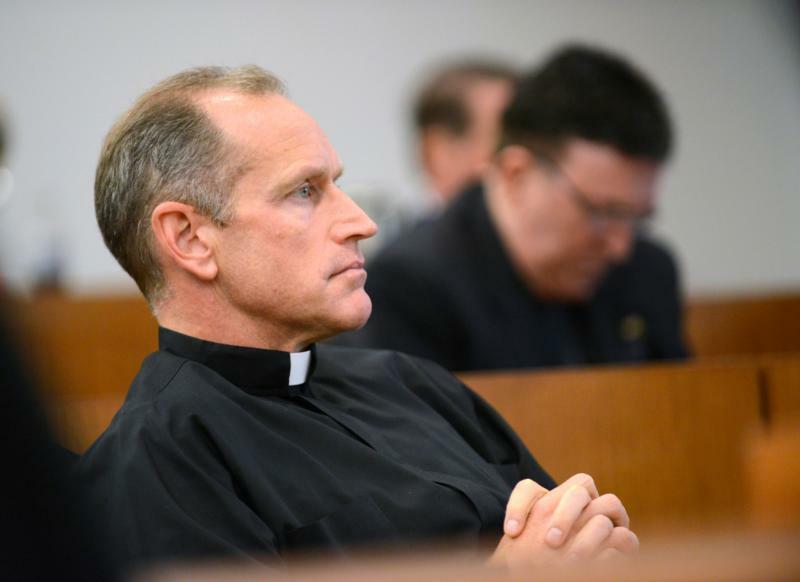 The 1987 Villanova alum, who was a lawyer before joining the priesthood, reminded the Wildcats — no matter their religious background — of their ability to find strength in each other and God. “We do our best when we connect to each other and the vine,” the priest said he told the team. And it’s a message that seemed to resonate, because two days after the team’s 77-74 victory over the North Carolina Tar Heels, the priest said: “Humility is the team’s greatest strength. These young men are extremely talented, but what makes them unique is how they sacrifice themselves” giving up popularity or adulation for the team’s greater good. Just one example is Ryan Arcidiacono, the Wildcats guard who had the ball in the remaining seconds of the game with the score tied 74-74. Instead of taking the shot, he passed it to Kris Jenkins, whose three-point jumper won the game. The chaplain said the team’s humility is getting its greatest test now. Villanova’s win was its second men’s national title. The previous time the school won the national title was in 1985 when it beat Georgetown University. That also was the last time a Catholic college or university won the men’s national basketball championship. In celebration, the school was closed April 4 and a parade for the team is scheduled to take place in Philadelphia April 8. Jay Wright, the Villanova head coach, has been reminding the team to remember its place “since the buzzer has gone off,” Father Hagan told Catholic News Service April 6. He said the players have been told that just as they wouldn’t want a defeat to define them, they shouldn’t allow recent success to define them. But it seems Father Hagan also has had a key role in keeping this team humble. In an interview with phillly.com, an online news site, days before the championship game, Arcidiacono described Father Rob as the team’s rock. I agree. A great team and good example.